Logging regular practice time is essential to music students’ progress. Motivating students to adopt good practice habits can be a challenge, however. A few appealing tools can help students enjoy tracking their practice time, see progress towards their goals, and see rewards for their efforts. 1. Practice Charts. Keeping a practice log is a great way to make practicing a daily habit. For younger students, choose a practice chart that simply records whether they practiced on a given day. (The link below includes a color-in chart that’s easy to use and visually represents their practice sessions.) Older students will benefit from charts that record the number of minutes practiced. They can work with their teacher to set reasonable goals and then track their progress with one of the four different designs of practice charts below. 2. Beethoven Bucks. It would be nice if students’ practice was always intrinsically motivated, simply for the love of music. Realistic music teachers know that’s not the case. For younger students especially, the promise of long-term improvement isn’t immediate enough to make daily practice sessions appealing. That’s where Beethoven Bucks come in. 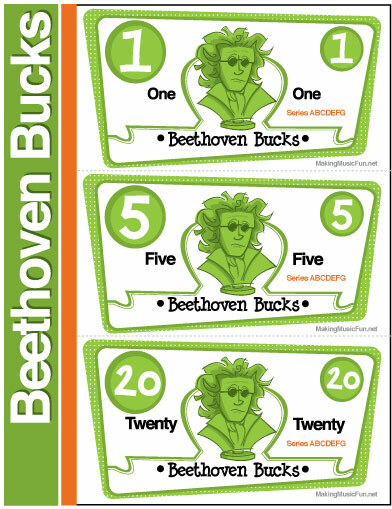 Work with your students to set goals and determine the Beethoven Bucks awards for meeting them (a list of suggested goals and rewards, along with goal tracking sheets, are included with the package). Decide in advance what the Beethoven Bucks will allow the students to purchase, and at what cost. These might include physical prizes of various values, from inexpensive sheet music or snacks to larger gift cards or whatever else you may have available. Bucks could also buy intangibles, like privileges or experiences, such as attending a local concert, bringing a friend to a lesson, or anything else you know your students would enjoy. 3. Music Report Card. Communication regarding students’ progress can also serve as a motivator. It can be difficult for students to gauge their own progress, so getting feedback from their teacher on a regular basis is important. Students who do practice regularly and improve as a result will see the fruits of their efforts in your positive reports. 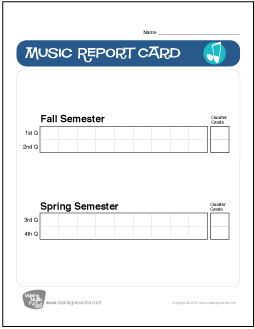 The simple report card format below is easy for you to use, with a blank for each week in the quarter and a space for an overall quarterly grade. You can use traditional letter grades or a system of your own to indicate students’ overall progress or track a specific aspect of their development. 4. Music Award Certificates. Words of commendation from a respected teacher can go a long way. In addition to regular affirmation, mark specific accomplishments with an award certificate. Follow the link below for over 30 different music award certificates for various situations. Many are general enough to be used for whatever achievements you would like, whether it is meeting a practice goal or reaching other goals through faithful practice. Ultimately, you can’t decide for students whether or not they will practice each day. You can, however, provide the tools and motivation to encourage them to do so. Want to give your elementary music lesson students a fun challenge? Provide them with a copy of this free clown music practice chart and challenge them to practice for 14 days (two weeks) without missing a day. Each day your student practices they record their practice by coloring a balloon. When the final balloon is colored they return the practice record to their teacher to share what they achieved. The teacher may choose a variety of goals from just doing something every day, to a 20 minute, 30 minute, or 1 hour per day goal. For some students recognition of their achievement will be enough. You could even reward them with a music award certificate signed by their music teacher. Other students may like a prize for meeting their goal. Decide on a reasonable prize that parents can provide before beginning the practice challenge. It might be an ice cream cone or a game from their iPad. Want to Browse More Music Award Certificates?